Meat Free Week starts today and I am super excited to support such great initiative given I am a meat eater and not ashamed of it. I support it because it is very much focused on education, raising awareness and helping people make more informed choices. It is not about preaching conversion to vegetarian or vegan, it is not about pointing fingers. It is about making us think where our food comes from and what it takes for it to be at our tables. So, this is it. The start of my Meat Free Week! Yay! Because I want to be more responsible and more informed, not to mention challenge myself. Meat free diet has historically always been a challenge for me. I don’t go crazy for meat but I do have cravings and once in a while I love a great steak. When it comes to daily portions of meat I find fish hardest to drop off my diet. Red meat, processed meat and chicken (in this order) are easier to avoid but fish and seafood in general is a struggle. Giving up meat for a week will be a great, fun challenge and will be good for my body but what is more important is that this time I am going a step further and really making an effort to learn about the extend to which eating meat affects our health and the cost to the environment. -Learn about animal welfare, in particular those animals raised in factory farms, the impact meat production has on our planet’s resources and the implications eating too much meat has on human health. – Share one article a day that educates on the impact excess meat eating has on our environment. Well, let’s just admit that when it comes to dieting the moment of ‘You are not allowed to have that thing that you love‘ is perhaps the worst moment of any diet start. I might not love meat but it is still true for me because I am a meat eater. My first thought was ‘It’s only a week, I will celebrate success with a bowl of crispy streaky bacon‘. So, my trick is to turn the tables around and look at this as a great opportunity to try fresh new recipes, to experiment with food and to share my experience. I want to really embrace it not as a chore but more as an exciting experience. – Order the streaky bacon for the celebration finale, it must be Spoilt Pig, no other bacon will do. As I said these were my mental notes. What I actually did was to research vegetarian breakfast and lunch recipes that are easy, fun and quick to make and get the blender out. Stock up on fruit and veg for my first couple of days, then have a massive burger for Sunday lunch and then cook a pea and mint risotto with coconut cream for Sunday dinner to prepare my mind for the week ahead. Here is the proof, see not joking, totally cooked the risotto and it was super yummy! 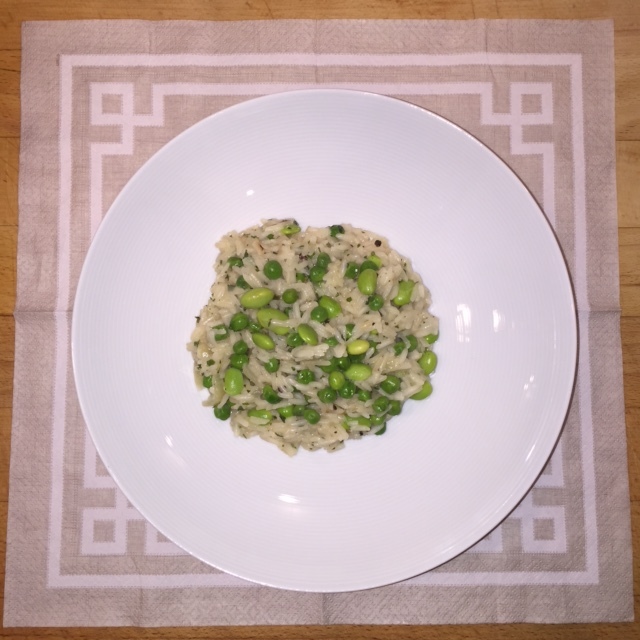 Pea and mint risotto with coconut cream. I made this from scratch and without a specific recipe in mind. It was created out of desperation really. I was really hungry in addition to an empty fridge. I was adamant I am not having a take-out so was forced to open my storage cupboards and try to figure out if I can make something out of nothing. I did have a lonely onion in the fridge and some frozen peas in the freezer so risotto seemed like an easy option. Heat up the coconut oil in a frying pan. Chop the onion in cubes and add to the oil. Fry gently on slow heat until softened. Add the cup of rice and fry with the onions for a minute. Dilute the vegetable stock in a cup of hot water and add to the rice. 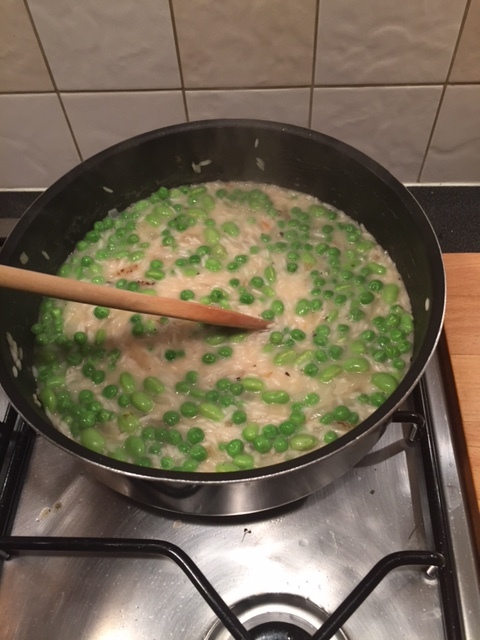 Add the peas, season with salt and pepper and add another cup of hot water together with half the coconut cream. Close the lid and let it simmer until almost cooked. Add the rest of the the coconut cream and mint to taste ( I don’t like it too minty for example) and leave to cook. It should take no more than 20min for the rice to cook. make sure that you keep an eye on the pan to make sure your rice does not dry up. It is supposed to stay creamy.